^ Lipscomb, Hester J.; Nolan, James; Patterson, Dennis; Fullen, Mark; Takacs, Brandon C.; Pompeii, Lisa A. (2011). 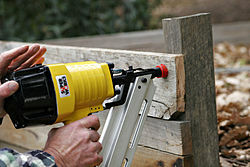 “Buyer beware: Personnel selling nail guns know little about dangerous tools”. American Journal of Industrial Medicine 54 (8): 571–8. doi:10.1002/ajim.20954. PMID 21472746. ^ Centers for Disease Control and Prevention (2007). “Nail-gun injuries treated in emergency departments--United States, 2001-2005”. Morbidity and mortality weekly report 56 (14): 329–32. PMID 17431377. http://www.cdc.gov/mmwr/preview/mmwrhtml/mm5614a2.htm. ^ Lipscomb, Hester J.; Nolan, James; Patterson, Dennis; Dement, John M. (2008). “Prevention of traumatic nail gun injuries in apprentice carpenters: Use of population-based measures to monitor intervention effectiveness”. American Journal of Industrial Medicine 51 (10): 719–27. doi:10.1002/ajim.20628. PMC: 2574677. PMID 18704898. https://www.ncbi.nlm.nih.gov/pmc/articles/PMC2574677/.